[BB-Blog]: I cut down trees. I eat my lunch. I go to the lavatory. I cut down trees. I eat my lunch. I go to the lavatory. Sorry for the lack of bloggity attention lately, but things have been a little wacky here on the BB front. Hopefully things will settle down soon. Anyway... nuffabout me. You should look at this here print. 19 x 25 print on French Cordtone paper — a collaboration with the talented Aaron Martin! 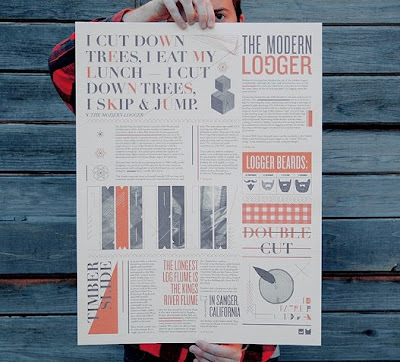 The poster is an homage to typography, wood, the grid, nature, geometry, flannel and lumberjacks. The poster is built off a 16 column grid. It's an homage to Monty Python.. Dur!